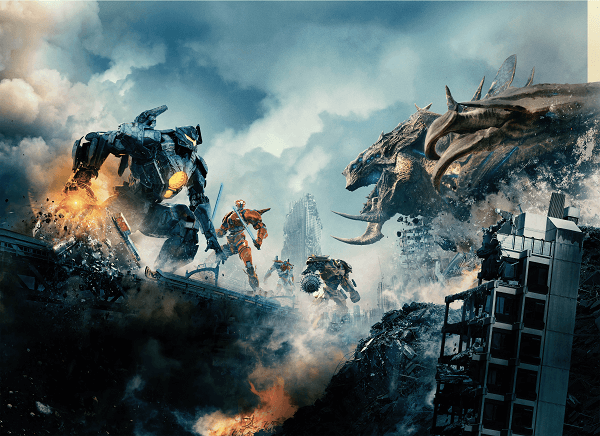 The Gist: Ten years on from the events of the first Pacific Rim, a Kaiju invasion threatens the Earth once more. The threat is triggered by Chinese super-conglomerate Shao Industries, who in a bid to muscle in on the Pacific defense market, have developed super advanced Jaeger drones using top-secret tech. Once the ‘secret’ of this tech gets out, all hell breaks loose. It’s up to a few good men - and kids - to save the world from another giant interdimensional monster attack. 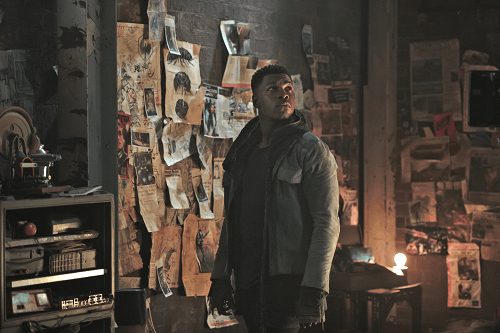 Step up Jake Pentecost (John Boyega) - son of the first film’s hero, Stacker - to rise to the challenge and lead a fightback, with a few young Jaeger cadets in tow. Nobody even thought of giving the original Pacific Rim a chance before its release five years ago. After all, why would they have? America’s fix for giant robot action has always been catered for by Transformers, and people were already getting a little tired of that franchise’s modern film revival by the time 2013 rolled around. So it’s probably no surprise that thanks to director Guillermo Del Toro’s creativity, a then-underrated cast and some Godzilla-styled monsters, Pacific Rim ended up being quite the cult hit. Cinema goers were pleasantly surprised, critics were stunned, apocalypses were indeed cancelled - and all evidence pointed to it kickstarting a saga that would fill a creative void that the blandness of Michael Bay’s Optimus Prime blockbusters failed to fill. Conversely, that’s exactly what winds up being the problem with Uprising. Putting expectations upon a franchise that originally thrived without them can only spell disappointment, and that’s exactly the case with this sequel - a follow-up that provides plenty of robot-smashing-alien action, but none of the originality that the first movie hinged on. Perhaps a key reason for this merely sustainable follow-up is that the original’s success clearly turned gears in the heads of the marketing department at Universal. Unexpected hits lead to unexplored sales opportunities, and what better way to expand your profit margin than a shift in movie narrative towards children, and lucrative toy sales? The original may not have been a tour-de-force in mature storytelling, but it was still a solid action movie for all ages. Uprising, meanwhile, gives us none of that. With Del Toro’s presence over this movie only in name alone - wisely, he chose to work The Shape of Water instead - Uprising lacks both the verve and inventiveness that made its predecessor so entertaining. We instead get a main plot stripped of character complexity and focused on a group of spunky but paper-thin kids, led by a reformed crook turned military commander whose own redemption comes by that tried and tested trope of Needing To Step Up And Take Responsibility™. Throw in a heavy dose of big corporations meddling with things they shouldn’t, and we essentially have a story that is Spy Kids meets Transformers, with a little sprinkling of self-delusion in believing itself to be Ender’s Game meets Gundam. Still, we do get some lovely giant mechs to gawp at, and some thoroughly engaging action sequences. Those Jaegers - the giant, monster-thumping mechs that make this franchise - are back in all their immense, daftly-named glory (Saber Athena! Gipsy Avenger! Bracer Phoenix! Revolver Ocelot! Okay, maybe not the last one). Similarly, the equally colossal Kaiju return again to emerge out of the Pacific Ocean and wreck whatever urban metropolis they can lay their flippers on. In this case, Tokyo gets the wooden spoon for the film’s city-sundering finale, and for all intents and purposes it’s a deeply satisfying one if you value your giant robot action. The trouble is that most of what leads up to it, as previously mentioned, is barely meticulated, pedestrian fluff. It’s just as well that the CG department remained on board to deliver some great action scenes, because the script has certainly done no-one here any favours - least of all a talented cast who just about keep the movie from a complete meltdown. John Boyega heads the cast in the wake of Idris Elba and Charlie Hunnam departing from the franchise. As Jake Pentecost, he also gives us a solid, charismatic lead figure to hinge Pacific Rim’s future fortunes upon - despite the writing forcing him to go from a party-loving, decommissioned Jaeger thief to a leadership-signalling Jaeger pilot tutor in the blink of an eye. The movie explains this contrivance by first getting him arrested by the Pan-Pacific Defense Corps for a botched scrapyard break-in, and then having returning character Mako Mori (Rinko Kikuchi), now PPDC General Secretary, give him a choice between prison or joining their ranks. It’s the usual son-begrudgingly-following-in-his-father’s-footsteps shtick, but Boyega’s clear ease with the rogue-hero role - no doubt bolstered by his time with Star Wars - shines despite the film’s flippancy in how it treats his transition. All in all, his performance is a great demonstration of his range, too: Pentecost comes across starkly rougher around the edges than the cleaner-cut Finn, despite both sharing fairly similar molds. As for the rest, there isn’t really a bad performance from anyone - just poor writing keeping certain individuals from standing out. Rinko Kikuchi’s appearance effectively adds up to little more than a cameo. 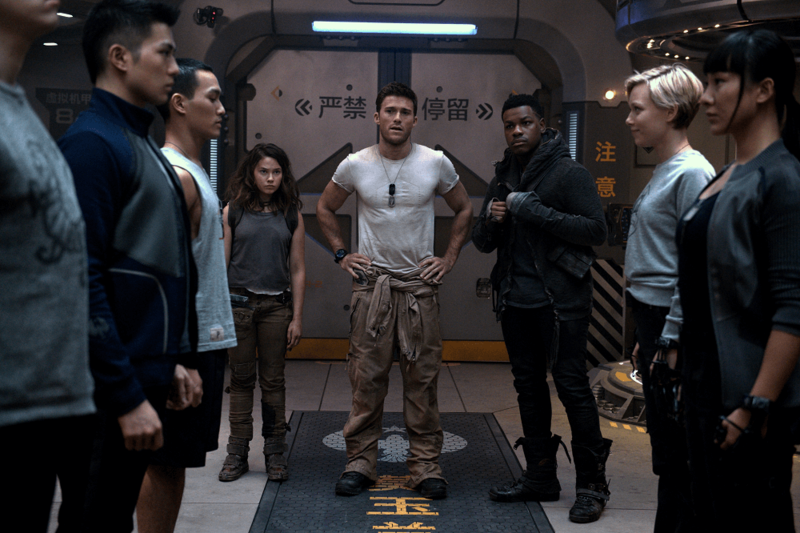 Scott Eastwood’s role here as Nate Lambert, Pentecost’s fellow Jaeger tutor, offers a character solely for a disagreeable-but-brotherly bond with Boyega’s character and little else. 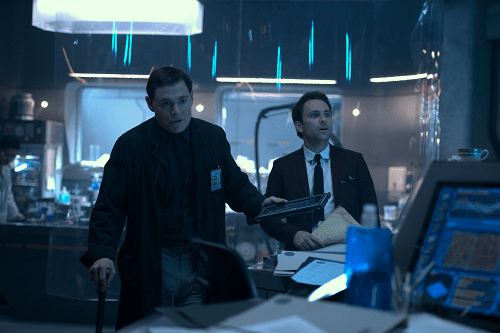 Burn Gorman and Charlie Day at least give us some decent comic relief returning as Dr. Gottlieb and Dr. Geiszler respectively. In the case of the latter, Day also makes for an enjoyably goofy villain when the film’s big, Kaiju-spawning twist is revealed. 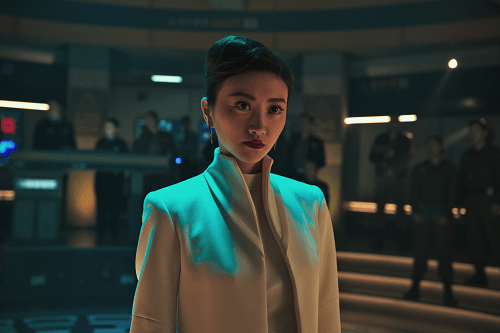 Said twist also gives Tian Jing, here as Shao Industries’ calculating, no-nonsense boss Liwen Shao, an opportunity to cap an engaging performance with a few action-heavy closing scenes. But when it comes to the film’s focal Jaeger cadets, the lack of personality is jarring. Save for Cailee Spaeny as Amara Namani - a delinquent robot tinkerer who only joins the cadets thanks to also getting arrested when Pentecost stumbles upon her workshop - it’s genuinely difficult to remember anything about the others, aside from that they all hail from different parts of the world. It’s a crippling and baffling oversight of the writers, too. Considering that Amara and her cadets are a group the film dedicates so much screen time to, it’s alarming just how little of time is spent developing them, considering director Steven S. DeKnight’s knack for adding such depth (Spartacus, Daredevil). 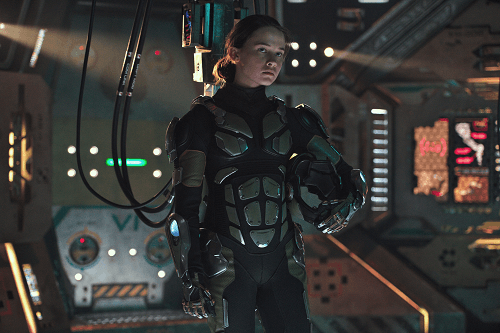 Instead of rooting for these kids during the film’s climax, we’re instead rooting for the Jaegers - and if this franchise is to continue with credibility, that’s something that Legendary simply cannot allow to happen in any upcoming follow-up. In the end, Uprising feels very much like a Pacific Rim sequel in terms of aesthetics, while completely forgetting that the spirit of the film was in the little details. It still manages to be an entertaining enough mecha fight-fest thanks to it not forgetting to provide renditions of the first film’s splendid choreography and beautiful CG. But with characters this roughly-sketched and a script so highly-strung that it feels improvised, any hope of the franchise continuing to defy its doubters - and keep its backers satisfied - may well have been extinguished. Not so much an uprising; more of a fall from esteem.